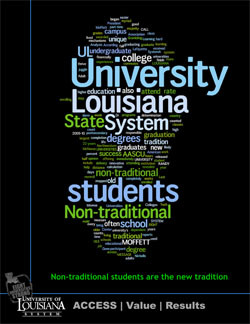 By now, you have probably heard that non-traditional students are the new tradition in the University of Louisiana System, but what does that really mean? Well, that means many of our students do not attend our eight universities right out of high school. They are older, holding down one or two jobs or may have served in the military. They may have chosen to get a degree after raising a family, changed career paths or started at another college or university. Click here to read profiles about non-traditional students attending University of Louisiana System institutions right now and how Grambling State University, Louisiana Tech University, McNeese State University, Nicholls State University, Northwestern State University, Southeastern Louisiana University, the University of Louisiana at Lafayette and the University of Louisiana at Monroe are addressing their unique educational needs.